I apologize for giving you this letter all of a sudden. I am Takumi Aizawa, from Iidate village, Fukushima. Iidate village is one of those areas seriously polluted with radioactive materials in the Nuclear power station accident in Fukushima. Although the pollution has been serious enough to vacate the village right away, the residents were the latest to be able to evacuate. I’d like to tell you what has happened in the area. It is also the confession of my own fault. 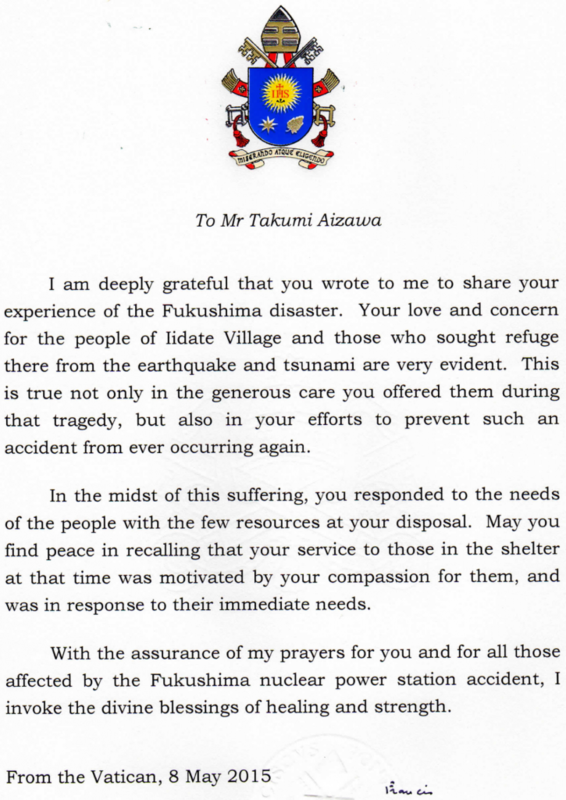 Just after the accident, the people escaped from Tsunami came long way to Iidate village which is located far away from the nuclear power station. The people feared the nuclear power station accident also escaped to the village. They thought it might have been safe in Iidate village, as there are some mountains in between. At that time, I worked at the elementary school in the village. The gym at the school was the largest shelter in the village. The shelter opened on 13th March and closed on 18th March, and I stayed and worked there. It was snowy and cold winter time in March, 2011. The gym was not warm enough although there were many old people evacuated. We were concerned that they could have suffered from the cerebral stroke or heart attack. We didn’t have any medicine and the only thing we could do was to give them as much water as possible. 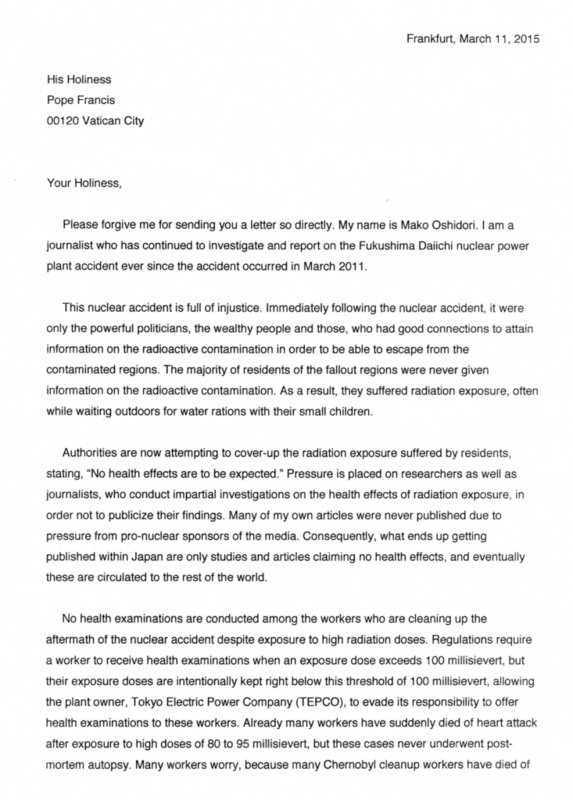 However, we later came to know that the tap water in Iidate village had been polluted by radioactive materials. Since the evacuation instruction has been given out to Iidate village, I made a research on the things happened to the residents of Iidate village. In some records, I found that the exposure dose of the people at the shelter was much larger than that of ‘the residents using well water’. I couldn’t find a word to say. The government even tells the residents of Iidate that ‘there would be no health damage’. 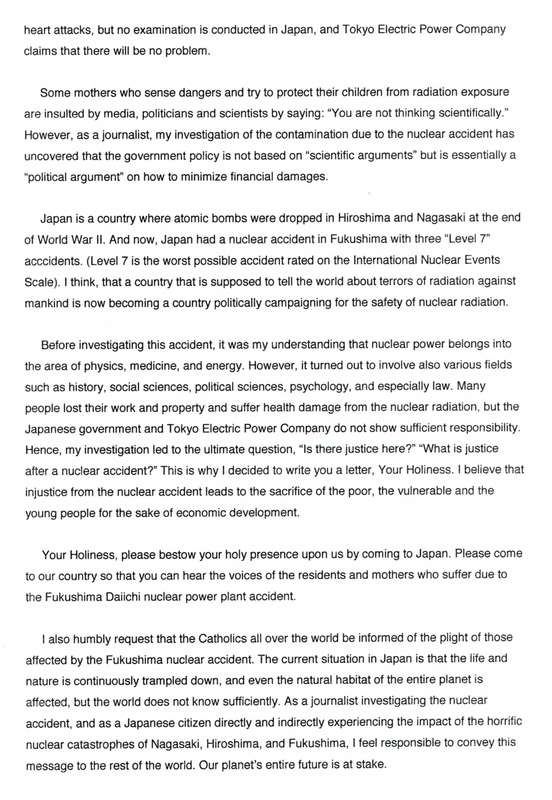 The scientists have been abusive toward those concerned about the health damage of radiation and call them ‘foolish’. At present, there is no possibility of official compensation. Talking about the fact may only make a shadow on the life of the evacuees who are now living in happiness. Since the accident, the government and some scientists have consistently been claimed that ‘there would be no health damage’ and ‘the very cause of health damage should be the stress created by the fear of radiation’. They even say that avoiding radiation is ‘the desecration of natural blessings’ and that telling the residents in polluted area that ‘there is no problem eating all’ can be the compassion for them. They started to insist that it is love and justice, and reverence for nature. Though I’m not a christian, I pray to God. Please reproach me for my fault. I have been silent. If the people in Iidate village are guilty, please give just me a punishment. They haven’t been told any possibility of serious pollution in tap water. I knew that. I don’t think I can be forgiven for that. Please give me a punishment. The accident of nuclear power station in Fukushima was caused by unexpected earthquake and Tsunami. But everything happened after that should be human-generated disaster. We all learn from the accidental events, even from the natural disaster. However, we haven’t learnt anything from the accident in Fukushima. We are passing over in silence, all about having delayed evacuation and not measured the primary exposure, making them as the ‘things that didn’t exist’ and ‘trivial’. They are trying to hide them behind the words like love and justice. This is the evidence of the human-generated disaster (not the natural disaster). Nuclear power is the energy beyond the control of human beings. Once it goes out of control, there is nothing we can do. It changes the world totally different. In Japan, the ideas of ‘love’, ‘justice’, and ‘reverence for nature’ have been changed. 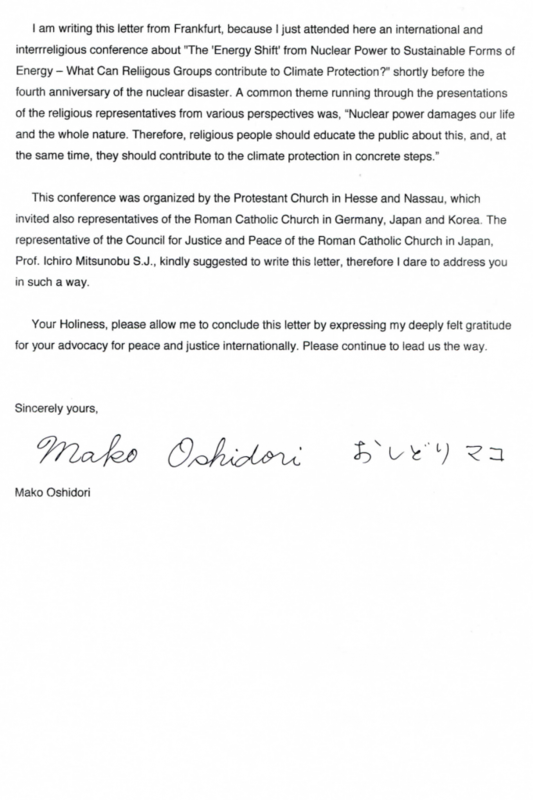 His Holiness Pope Francis, please come to Japan and give us a prayer, to make the ideas of ‘love’, ‘justice’, and ‘reverence for nature’ back to the rightness. In March, 2015, there was the “Internationale Tagung: Von Atomkraft und Religion” (The international conference for The ‘Energy Shift’ from Nuclear Power to Sustainable Forms of Energy) in Germany. 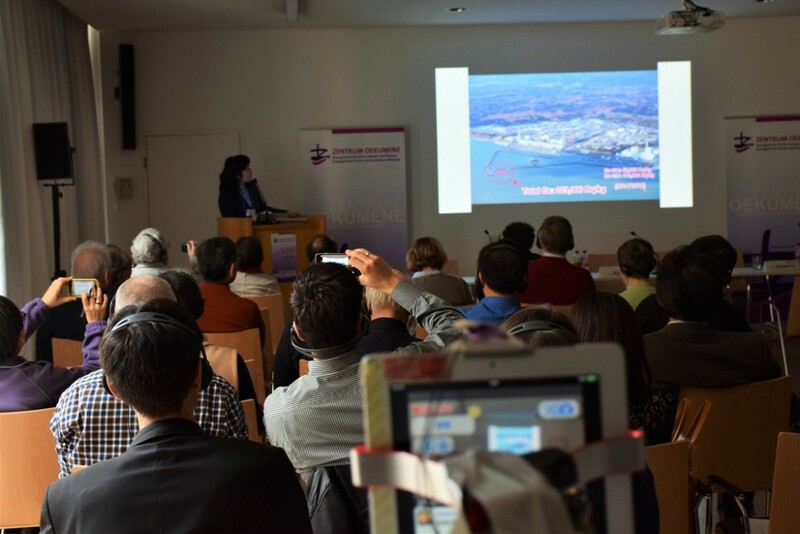 I joined the conference and happened to know that there are many people working seriously on this worldwide problem to make the Nuclear power station accident in Fukushima to be the last nuclear disaster. This is clearly the issues of ethics and justice. I felt I could not keep silence anymore. 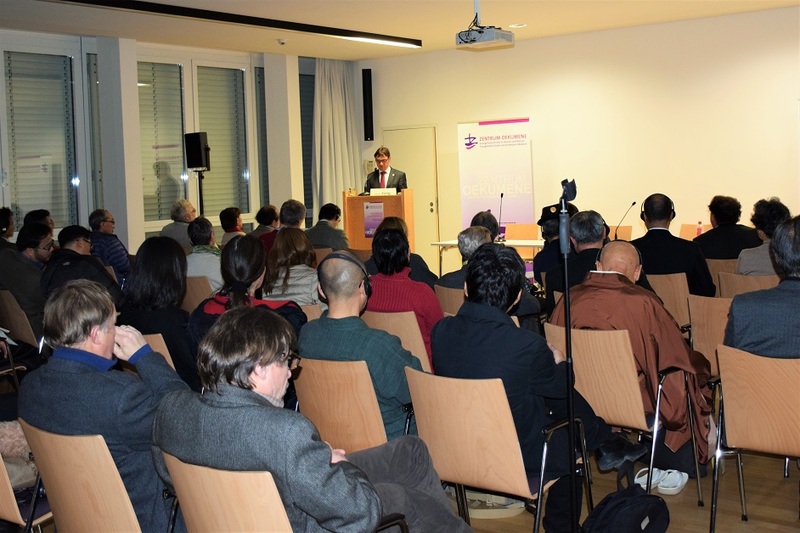 This conference was organized by the Protestant Church in Hesse and Nassau,which invited also representatives of the Roman Catholic in Germany, Japan and Korea. The representative of the Council for Justice and Peace of the Roman Catholic Church in Japan,Prof.IchiroMitsunobu S.J., kindly suggested to write this letter,therefore I dare to address you in such a way. 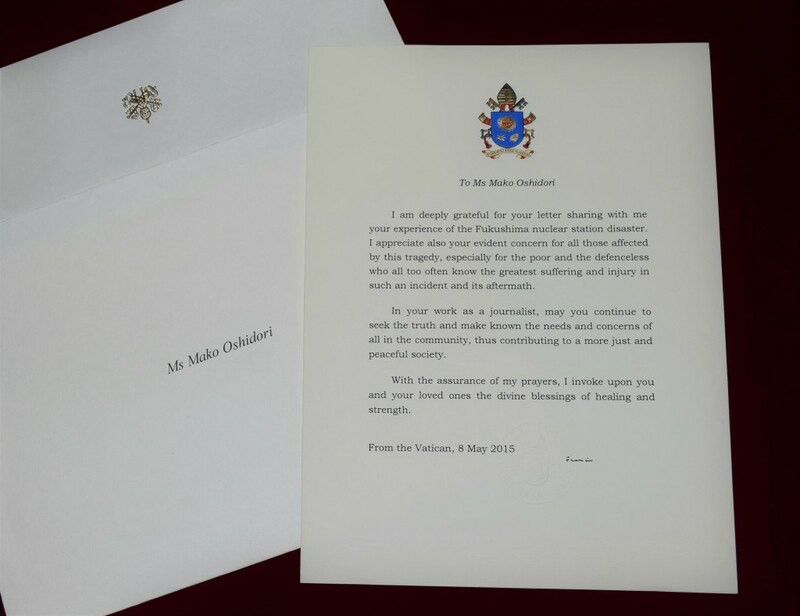 His Holiness Pope Francis, I thank you so much for sharing time to read this letter and I apologize for my rude behavior again.